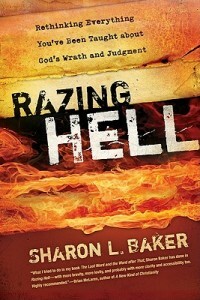 In this first-ever interview on Beyond the Box, Ray interviews Sharon Baker, author of the book “Razing Hell: Rethinking Everything You’ve Been Taught About God’s Wrath and Judgment“. Dr. Baker’s views are very much in line with recent episodes that we have done on Beyond the Box, and yet she helps to drive the conversation even further. In this first part (second part will be posted within a few days), Ray and Sharon go down several rabbit trails, taking time to camp out on various topics relating to forgiveness, justice, and possible cultural impacts on the way people in the Old Testament understood God. First thing that jumped out at me was regarding the cities of refuge in the O.T. That wasn’t familiar to me at all and I am now looking forward to studying up on those. I loved the picture of Jesus as our city of refuge! I also never really “got” how this all revolves around nonviolence. Now I’m seeing the connections between nonviolence, wrath, the cross, inerrancy, and how all this stuff works together. The second thing that jumped out was the discussion around the O.T. sacrificial system. This is something I’ve been trying to wrap around my brain for a very long time. I thought Sharon explained it so well especially in her statement about the life being in the blood of the animals. The animals aren’t being punished, the picture is about our internal life of submission not the external ritual/sacrifice. The blood is a symbol of us giving over our lives…an awesome picture. Wish I could sit in her classroom for a semester or two! It’s a great privilege to be able to be taught via this podcast. Thanks for following through on that internal prompting and sending out that email. Looking forward to part 2. Hi, I just wanted to say the for me Jesus’s crucifixion is what makes sense of everything. It is amazing because it shows me that God was willing to suffer everything that we suffer (and more) to show us that he knows how we feel, because he has felt it. We can trust his whole plan precisely because through his death we can know how much he was willing to go through to carry it out! I don’t see the cross as Jesus taking the punishment I deserve so much as Jesus showing me how much I mean to him. If Jesus never existed how could I ever really know God loves me?